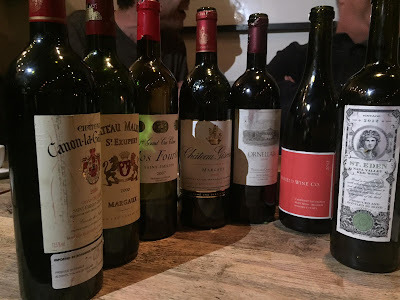 On a claret-themed evening, we wound up matching pairs of Saint Emilions and Margaux against a Super-Tuscan and a pair of Californian clarets. Another easy win for France. A bottle of Godello, a novelty for all of us and a tasty undercard, kicked off a very fun night. This white wine is made in small, limited quantities, as Bierzo is really red wine territory. I'm not sure it's a wine that would replace any of my go to wines, but it's the kind of change of pace that is the reason the wine world in 2018 is such a lovely place.There's a very light note of oxidation, just some nuts, really, that recedes to dusty chalk that I can’t really place. Then restrained, flavorsome acidity that is easy to like and yet is not overtly flattering. Lovely. An absolutely classical nose, with cedar and iron and a restrained opulence of spices, and an elegant and soft palate. A little young, though, for me, even now. 2007 was a Bordeaux vintage I never dwelt on. It was never well regarded, then or now, and I just didn't know at the time enough about Bordeaux to find the good picks. I still don't. Oddly enough, the nose is very similar to the Giscours, but eventually, a wine needs drinking and the palate is a bit fatter and flatter, coarser, with drying tannins beneath the fat fruit. If the palate catches up with the nose, it will be a sweet pleasure. This is the last of three or four bottles I have drunk of this, and even this bottle is still not fully ready. The nose is packed with earth and minerals, while the palate starts out though as nails, then softens enough to show very good complexity and elegant muscularity. The best Bordeaux of the night, I thought, for its precision is nought else. Like the Giscours, this also shows opulent spices and elegant restraint. The nose: the perfect hybrid of Bordeaux and Tuscany, capped by lead pencil and chives. The palate disappoints me at first, the low acidity making for a dull impression. The second impression a while later is much better, a rusty bite slicing through what I first took for a slightly hollow mid palate to a focused, spicy finish. In the end, it almost convinces me that it's worthy of its prestige and price, even though the low acidity remains a bummer. This plays out like a petit chateaux, maybe a touch riper than you’d get in Bordeaux, with a nice mineral veneer. With an overwhelming attack of bitter sweet oak, this really doesn't take any prisoners. Having said that, it has good complexity and extract, but it's the first wine I've had that felt like a skank. A high maintenance, four hundred dollar skank.